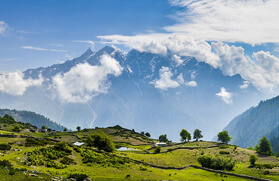 One of the toughest treks in the Garhwal Himalayan region, the Nandikund Trek that stretches from an elevation of 3,497 meters to 4,800 meters, is one of the least explored treks in the Indian Himalayan belt. 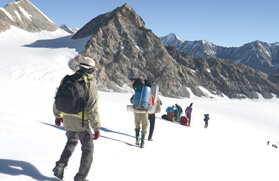 The journey encounters a very strenuous trek having steep climbs and further there are many sharp turns through narrow ridges that pass through crazy and twitchy paths. 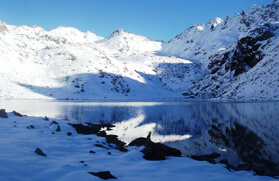 Nandikund at an elevation of 4,500 meters, one of the pristine high altitude lakes in the Indian Himalayan region that is surrounded by several notable peaks, the prominent being the Chaukhamba group of peaks, is truly a paradise to trekkers. It is believed that Nandi Kund is as deep as it is big; the Kund spreads over an area of one and half km. It is the source of River Madhyamaheshwar Ganga. 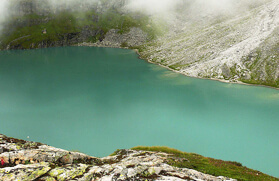 The trekking trail leading towards this revered lake is marked with streams coming from the top, and you have to cross these streams to reach the Kund. Further, the vicinity is also considered as one of the holiest by the Hindu pilgrims that dilates a diorama of the Pandavas from the Indian epic, the Mahabharata. 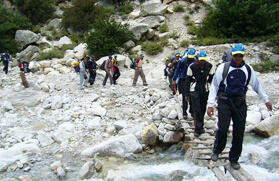 The trek to Nandikund commences from Ukhimath, which is easily accessible by road from Rishikesh via Srinagar. 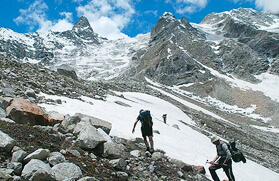 From Ukhimath the route heads to Madhya Maheshwar via Bantoli and thereafter the trail involves a steep climb towards Kashani Dhar, which is approximately 10 kilometers of trek uphill. 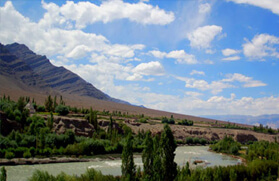 From Kashani Dhar, the journey heads to Kashani Tal and thence leads to Pandav Shera. The trail from Kaahani Dhar to Kashani Tal is approximately 2 kilometers and to Pandav Shera it is approximately 14 kilometers. There again the trail continues further 6 kilometers to Nandikund and after an overnight camping the journey follows a trail downhill to Dwari Gad. Later it snakes down to Dhaula Udiyar and thereafter to Ukhimath via Bantoli. 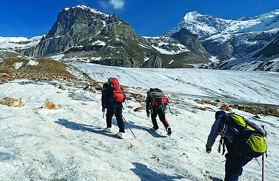 The Nandikund trekking tour in the Garhwal region leads to Rishkesh beholding some of the best adventurous moments of your lifetime. In the morning from Delhi board the AC train for Haridwar scheduled at 06:50 AM. By 11:30 AM you will reach Haridwar where our guide will receive you and transfer to Rishikesh by Road and check into the hotel. The evening time is free which you go for sightseeing and explore the local places of the city. 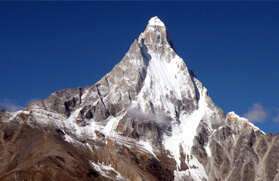 An overnight stay is arranged at the hotel in Rishikesh. In the morning, after having early breakfast we will drive in the direction of Mansuna passing through Rudraprayag, Devprayag, and Ukhimath. Mansuna is approximately 230 kilometres away from Rishikesh. On the way, we will halt for having lunch at Srinagar. We will be staying overnight in a hotel/ guest house at Mansuna. After having healthy breakfast, we will begin our journey and drive to Uniana, which is about 15 kilometres from Mansuna. 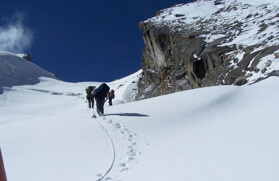 This will be the first day of the trek wherein we will hike for about 11 kilometres to reach our destination Bantoli. We will be staying overnight in a tent/guest house at Bantoli. Today after having wholesome the breakfast at 8.00 AM, we will start out trek and hike for about 8 kilometres to reach Madhyamaheshwar. By 12:00 Noon we will reach Madhyamaheshwar. We will then visit Budha Madhyamaheshwar and attend the evening Puja held at the temple. We will be staying overnight in a tent/guest house. Today after having breakfast at 8.00 AM, we will trek 10 kilometres along with packed lunch to reach our destination, Kachani Dhar. We will be staying overnight in the camp in Kachani Dhar. 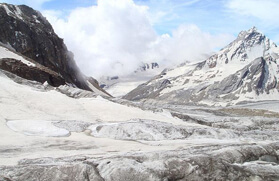 On this day of the trail, we will trek for 2 kilometres towards Kachani Tal and then from here we will continue the trail to Pandav Shera, which is about 14 kilometres away. On the trail, we will carry packed lunch along. We will be staying overnight in the tents at Pandav Shera. After having wholesome breakfast, we will head towards Nandi Kund, which is located about 6 kilometres away. We will be staying overnight in the tents at Nandi Kund. On this day, after having breakfast we will start our trek in the direction of Dwari Gad, which is about 12 kilometres away from Nandi Kund. On the trail, we will carry packed lunch along. We will be staying overnight in the tents at Dwari Gad. Today after having wholesome breakfast, we will trek to Dhaula Udiyar, which is 13kms from Dwari Gad. We will carry packed lunch with along. We will have dinner and stay overnight at the camp. In the morning after the breakfast, we shall trek 14kms to reach. We will carry packed lunch with along. We will be staying overnight in Tent/Guest house at Bantoli. On this day, we will head towards Uniana and will be covering about 11 kilometres. Afterwards, we will move ahead for about 53 kilometres along with packed lunch. Upon arrival at Uinana, we will drive towards Ukhimath. We will be staying overnight in the hotel in Ukhimath. Today, we will drive to Rishikesh, which is about (200 KM) from Ukhimath. We will be having lunch at Srinagar. Wake up early in the morning and head towards the Haridwar railway station to board the AC train for Delhi scheduled at 06:10 AM. You will reach Delhi by 11:45 AM.